New York State Public Health Works! recently honored the Oswego County Health Departmentâ€™s Public Health Educator Team. Diane Oldenburg, Eliza St. Onge and Angela Cimilluca were named to the Public Health Works! 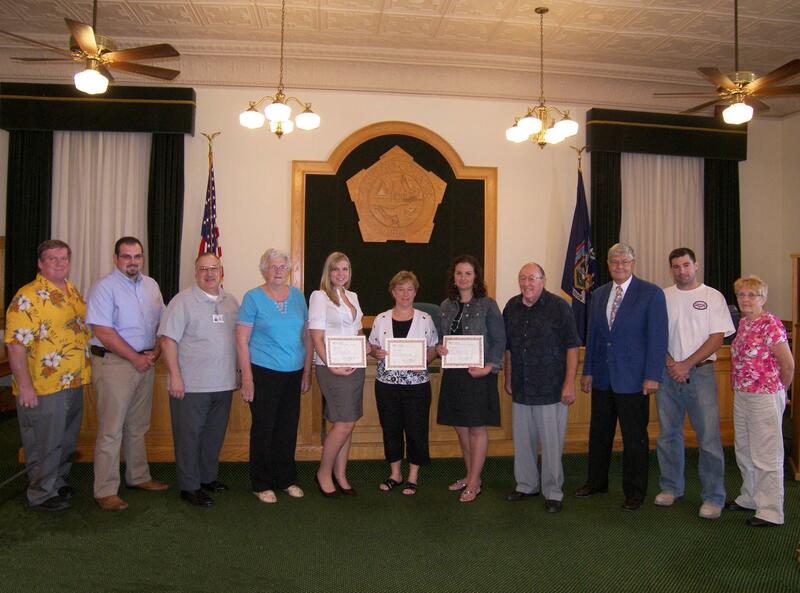 Honor Roll for their work in implementing Oswego Countyâ€™s Pandemic Influenza Response Plan. At hand to present the award was the Oswego County Legislatureâ€™s Health and Human Services Committee. Pictured from left: James Karasek, District 22; Terry Wilbur, District 21; Ron Sakonyi, District 5; Committee Vice Chairwoman Barbara Brown, District 8; Cimilluca; Oldenburg; St. Onge; Committee Chairman John Proud, District 7; Dr. Dennis Norfleet, Oswego County Public Health Director; Jacob Mulcahey, District 15; and Margaret Kastler, District 1. OSWEGO COUNTY â€“ New York Stateâ€™s Public Health Works! Honor Roll recently added three local healthcare workers to its roster. Diane Oldenburg, Eliza St. Onge and Angela Cimilluca are all public health educators with the Oswego County Health Department. The Public Health Works! Honor Roll recognizes the local public health workforce as an essential component of Commissioner of Health Richard F. Dainesâ€™ public health agenda to make New York one of the healthiest states in the nation. New York State relies on its local health departments to promote, protect and improve the health of its citizens. If you have any questions about immunizations or would like more information about healthy living, call your healthcare provider or the Oswego County Health Department weekdays at 349-3547 or 1-800-596-3200, ext. 3547.